Marc Tarpenning, one of the founders of electric car firm Tesla, spoke at a Silicon Valley Band of Angels lunch last week and shared his take on the founding of Tesla, electric vehicle technology, batteries, and the car business. Being able to call oneself a "Tesla founder" is a privilege determined by a messy lawsuit and a story we covered here, here and here. In any case, Tarpenning is a founder of Tesla along with Martin Eberhard, Elon Musk, Ian Wright and maybe Tom Gage and JB Straubel. Strong feelings still run high amongst that group. The history of the company includes boardroom drama and power grabs that are typical of VC-funded startups with megalomaniacal founders and investors. This is one founder's perspective on the firm. A decade ago, Tarpenning and co-founder Martin Eberhard studied the transportation industry and came to the conclusion that "[e]lectric cars are by far the best choice." After studying and analyzing the costs and benefits of hydrogen fuel cells, ethanol, and cellulosic ethanol, the two engineers were "convinced that electric was going to be the winner." Tarpenning noted that with close to a billion cars on the road and 2 billion on the road in the near future, "Even the head of OPEC says we can't power all of these with oil." They ruled out fuel cells ("Hydrogen is an energy carrier, not a primary fuel. And unfortunately, it's not a good energy carrier."). Turning biomass to ethanol was inefficient ("You'd do better by just burning it."). And the jury seems to be out on the efficiency of cellulosic ethanol and the practice of devoting arable land to transportation fuels. The two engineers also calculated that electric vehicles (EVs) are more efficient than internal combustion engines, even if the electricity source is from coal. Things look even better if the electricity comes from a combined cycle gas turbine, according to Tarpenning. Tarpenning said, "All the supercars ten years from now will be electric or electric-assisted." The duo funded a study with EV pioneer AC Propulsion about the feasibility of using lithium-ion cells. "Originally, all we wanted to do was the drivetrain," according to Tarpenning. However, the horizontally integrated aspect of the nature of the auto industry, with everything outsourced, convinced the duo to build the entire vehicle. April 2004: The firm had five employees and closed a Series A led by Elon Musk. SDL Ventures was also an investor in that round, which Tarpenning said was $7 million on a $7 million pre-money valuation. The founders estimated it would take $70 million to get the roadster into production. Jan 2005: The company now had eighteen employees and the mule ("a car that doesn't reproduce") went for its first drive. Another venture round was closed, led by Musk along with Compass Technology and Valor Equity Partners. Gliders (a car without a drivetrain) were being provided by Lotus. Jan 2006: Driveable Mule #2 completed. Engineering prototype EP1 being assembled. July 2006: "Public launch" with EP1 and EP2. Crash testing on EP3. January 2007: Cold weather drivetrain testing at the Arctic Circle in Arvidsjaur, Sweden. ABS and traction control tuning. Oct 2007: Delays in production due to failure of two-speed production transmission. According to Tarpenning, the transmissions all broke in different ways and wouldn't work past the 3,000-mile mark. May 2008: New drivetrain being tested. In Tarpenning's words, they were "rescued by Moore's Law." Improved IGBT technology in turn improved inverter performance and allowed Tesla to meet production targets with a one-speed transmission. Retail store opens in Los Angeles, Ca. June 2008: Tarpenning left the firm. He said that he owned as much stock "as he was ever going to own." First customer deliveries. Retail store opened in Menlo Park, Ca. Oct 2008: Elon Musk becomes CEO. "I wish he had done that earlier," said Tarpenning. "Elon was the perfect CEO -- it was bold and out-there." March 2009: Hundreds of Roadsters are on the road; Model S sedan announced with a projected 300-mile range. "We knew we had to get into the sedan market to get the price down." June 2009: 600 Roadsters delivered. U.S. federal government delivers $500 million loan guarantee. 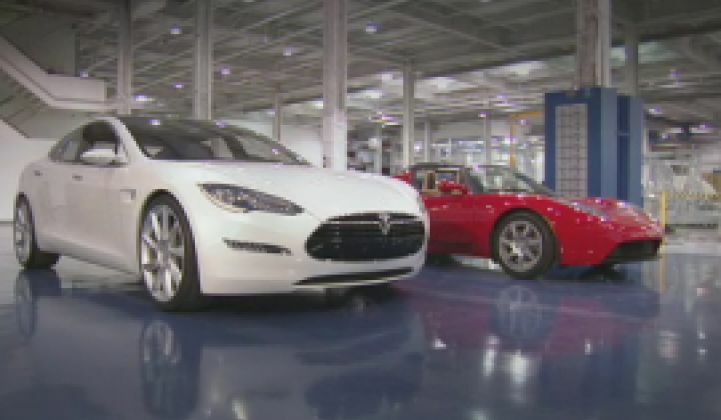 June 2010: Tesla went public soon after "the gift" of the NUMMI plant. "All the investors did well." EV technology is still in its in infancy, and not every EV will be a success. But every car company is launching an EV. Tarpenning confronted some battery myths. He dispelled the idea that batteries lack energy relative to an ICE, although one gallon of gasoline can provide 34 kilowatt-hours (an ICE is inherently inefficient, while an EV drivetrain is small and compact). He said, "The energy density of batteries at the moment is OK. It would be great if it was higher. Higher energy densities would yield more interesting cars." As far as battery life is concerned and the issue of the slow fade of battery performance, Tarpenning reiterated that the current battery is "OK." Batteries can endure 500 cycles, and that's over 100,000 miles, according to the Tesla founder. He noted that partial cycles are better than full cycles and cells should last the life of the car. Cells still dominate the car's bill-of-materials, but "prices are dropping in a slow Moore's Law." He noted that the Tesla motor design did not use rare earth elements such as neodymium. He suggested that lithium faces no materials shortage and that large reserves exist, but simply have not been tapped yet because we are in the early stage of demand for the element. Tarpenning said he is aware of new battery technologies such as lithium air, but added, "Unless they reduce their price, they're not that interesting." Tarpenning's conclusion was that "EVs are here to stay because they are so much more efficient than everything else." Tesla has a $3.2 billion market cap and has already made its early investors a considerable return. The firm has proven that there is demand for a well-designed electric vehicle. And as Tarpenning has said, battery technology could stand improvement, but it's really battery pricing that needs to be improved. Tesla's ultimate chapter as a mainstream automotive supplier is an act yet be written. Potential glory rests on the company's ability to scale to production volumes of the Model S Sedan in the coming quarter and in 2013. That will determine if Tesla and Musk become the next GM or the next Tucker.